Getting more range out of some kites, perhaps A LOT! Pigtail power tuning adjustments are frequently ignored. People often attach their flying lines to the same pigtail knots routinely regardless of how well matched their kite is to actual conditions. I can't speak for this working will all kites only some of those that I have used in the last few years. Not all kites have that many pigtail knots either. Will a longer trim strap provide equivalent performance? You've got me, my arms aren't super long and if the reach is too far it becomes a safety & convenience problem. You have to be able to reach the trim strap fairly easily. I will say that I have been adjusting both the pigtail attachments AND the trim strap to the max in succession. In otherwords, the trim strap alone doesn't cover the power range that you can cover tuning the pigtail attachments as well. 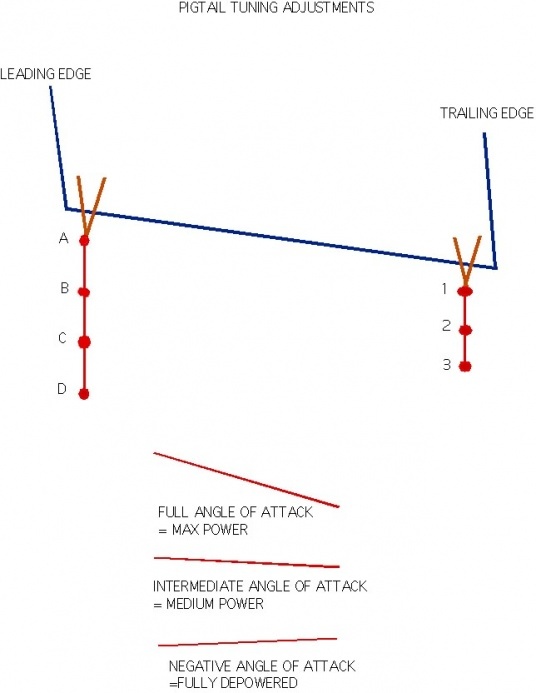 It is all about adjusting the angle of attack (AOA), of the kite. If it is high or large, the projected area of the kite is also high as is the power. You would do this if your kite is a bit underpowered for wind conditions. If your AOA is intermediate, then you are setup for the middle or "sweet" wind range for your kite. If your AOA appears to be almost negative or flat (when you sheet in the AOA will become positive again), you have the kite max depowered by the pigtail tuning for better managing overpowered conditions for your kite. D1 = max angle of attack for low wind. This will result in your kite appearing distorted or "oversheeted." This is supposed to be a bad thing and to be avoided. Strangely enough, I find it doesn't negatively impair my kite performance significantly and really improves the low end of what I am flying these days. Again, this may not be true for all kites. This adjustment will maximize your bar pressure as well and will slow down kite flight speed. If you have an option use a larger kite instead of rigging on these points. D2 = a little less extreme variation of max power from that offered by the D1 attachment. It is harder to have your flight lines slip in this position. A3 = minimum angle of attack for overpowered conditions. If you have an option, use a smaller kite instead of rigging on this points. B3 = a less extreme variation of A3 for managing overpowered conditions. Again, it is harder to have your flight lines slip off the knots in this position. C3 = middle of the road setting for winds in the "sweet" range for your kite. This seems to be where most people set up their kites. B2 = an intermediate depowering setting for slightly higher wind conditions. 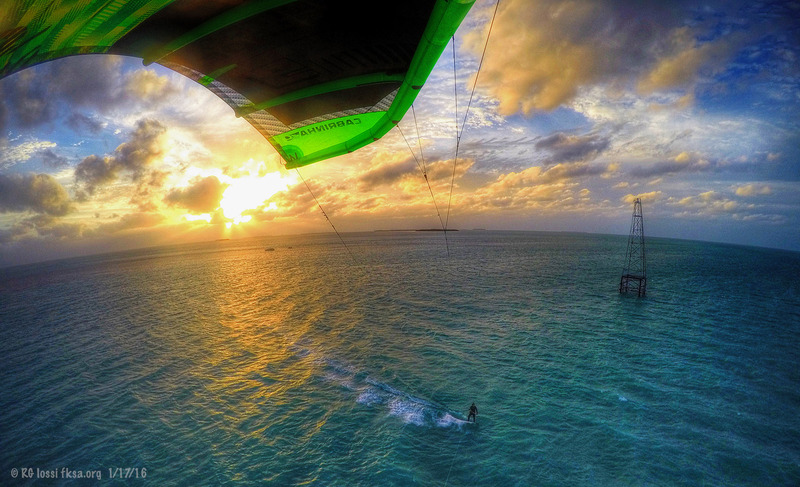 You can experiement with other variations to explore influences on kite power and general performance. You will find some variation in speed of kite flight, bar pressure, ease of jumping with various attachment points. The lower the letter and number you attach both flight lines to, the smaller the AOA and projected area of your kite and the lower the power,. higher wind the kite is tuned for. Conversely, the higher the letter and number, the greater the AOA and projected area of the kite and higher power. Some kites also have other nylon webbing pigtail attachment points to control speed of kite flight/response. Refer to your owners manual for tips on those settings. NOTE: A and 1 are not knots but in fact are the nylon webbing attachments to the kite. MAKE SURE your kite lines won't slip off and that this attachment doesn't cause wear of the straps. HINT: you are better off not using these attachment points, use a larger or smaller kite instead. So, give it a try and DON'T ignore pigtail trimming adjustments. On some kites they can make a major difference.